I could come up with a million reasons why I haven’t been blogging. My computer died. Presidential politics captured my attention. Microsoft Vista is the spawn of hell. All the excuses are true, but the real reason for my absence is that it’s summer in Alaska. The days are long, the garden is gorgeous, and I’m feeling lazy. The worst part of not blogging is the resulting guilt keeps me from reading my friends’ blogs. Irrational? Definitely. When I was a kid I had to clean my room before I could go out with friends; I learned early that prevarication and deprivation go hand in hand. Now, my need to read favorite blogs has forced me back to the computer. I'm also backlogged with recipes to write about. Naturally, since I have a giant backlog, I’m ignoring it and writing about the amazing bean and pasta salad I made two days ago. Generally speaking, I hate pasta salads and think green olives are disgusting. I started making Three Bean and Macaroni Salad solely as a treat for my husband, planning not to eat any of it. But when I tasted the salad for seasoning, I loved it immediately. 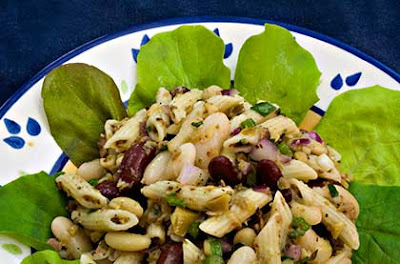 The dressing is uniquely tangy and delicious, while the beans and pasta balance the dressing’s strong flavors. Our garden greens are growing like crazy and we’ve been enjoying their fresh flavors. I recently made Plasto, a Greek greens pie with cornbread crust, and enjoyed every bite. If you’re looking for an interesting greens recipe, I highly recommend it. The salmon run has started and we’ve started restocking our freezer. Dukkah, an Egyptian spice mix, is great sprinkled over hot-off-the-grill salmon. I also use Dukkah to perk up salmon salad: crumble leftover salmon and mix it with minced onions, minced celery, minced garlic, a little mayonnaise, and a healthy dose of Dukkah. Delicious. This weekend Costco was selling flats of perfectly ripe figs. Yesterday I quartered and wrapped them in prosciutto for a quick, easy, and addictively good appetizer. If I were alone, I’d have it for dinner. A 10-ounce jar of green olives stuffed with jalapeños has about 25 olives in it. Since the salad is dressed with olive oil rather than mayonnaise, it’s a great salad for bringing to summer potlucks. If using dried beans, spread them out in a pan and inspect carefully, removing any pebbles or debris. Soak the three kinds of dried beans in cold water overnight. Drain the soaked beans and rinse with cold water. Add the soaked beans to a large pot of water, bring to a boil, cover, turn down the heat, and simmer for 30 minutes. Add 2 tsp. salt and continue to simmer until the beans are tender but not mushy. When the beans are done, drain and put them in a large bowl. If using canned beans, rinse well, drain, and put them in a large bowl. Thaw the edamame beans and add them to the bowl. While the beans are cooking, pulse the garlic in a food processor to mince. Add the olives, oregano, thyme, and 1/4 cup vinegar, and pulse to mince the olives. Add the olive mix, olive oil, onion, and celery to the beans and mix well. Bring a pot of salted water to a bowl, add the pasta and cook until the pasta is al dente. Drain the pasta, add it to the beans, season with salt and freshly ground black pepper, and mix well. Taste and add the remaining vinegar, salt, and freshly ground black pepper, as needed. Serve at room temperature. If plating the salad, serve on a bed of greens. This is my entry for Heart of the Matter: Picnics hosted this month by Joanna of Joanna's Food. welcome back - i am so glad to see you! Welcome back Laurie...I too had a big break and its good to recharge the batteries! Glad to see you're enjoying the summer and now we get to see your delicious creations again. This dish is a real winner...I adore green olives and I love "fasolia" so this is a win-win situation. Oh, by the way "Microsoft Vista is the spawn of hell..."....I had to laugh at that! (I'm a Mac user personally!). Laurie, welcome back! Your ears must have been burning yesterday as I was talking with Peter M. and I asked him if he'd heard or seen anything of you lately... Nice to hear that you've decided to set aside the spade and sit by the keyboard again. :) I know Alaskans probably tend to try and eke out as much enjoyment from the short summer there as possible, so your reason for stepping out is more than appreciated. 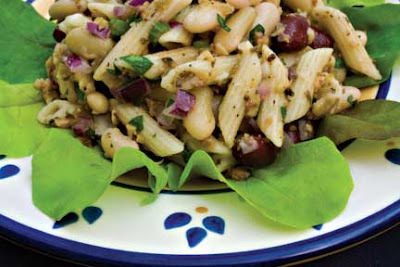 As for pasta salads, though I too am not a big fan, yours looks great! I think I could eat me some of that... :) Nice to see that you are back and i look forward to reading more of your posts soon. There are no rules! Just blog when you feel like it. When you need a break, take one, and we will still be there when you come back. Pleased to hear that the real world has a certain kind of summery pull, but it's always lovely to fnd one of your new posts in my reader. Gorgeous. Not a pasta salad fan myself...I trust you judgement implicitly, though. Bookmarking for warmer days! Thanks Maria! It took me two days to finish reading all your blog posts I missed, but it was truly entertaining reading. You do a good job. Peter G, I thought about switching to a Mac but decided the learning curve would be too steep. So now I'm dealing with Vista. Lucky me! Sam, my ears were burning and now I know why! You have exactly described the situation - with our short summers, we need to take advantage of the sun when it's around. Kalyn, you are definitely right but sadly my internal guiltameter has a hard time turning off. 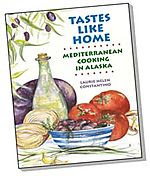 Lucy, I tried to analyze why I liked this particular pasta salad - I think it's because it has strong enough flavors to make the pasta interesting.